Over the past 15 years, the airline industry has been in constant transition. This can mainly be attributed to an ever-increasing competitive pressure, which has additionally been intensified by the continuing growth of low-cost carriers and the upcoming of the Gulf airlines. As a consequence, airlines which are not capable of streamlining their operations sufficiently often struggle with this competitive environment and may become targets for mergers and acquisitions. However, as has been shown for various transactions in the past, the expected synergies do not necessarily materialize over the course of the integration process. 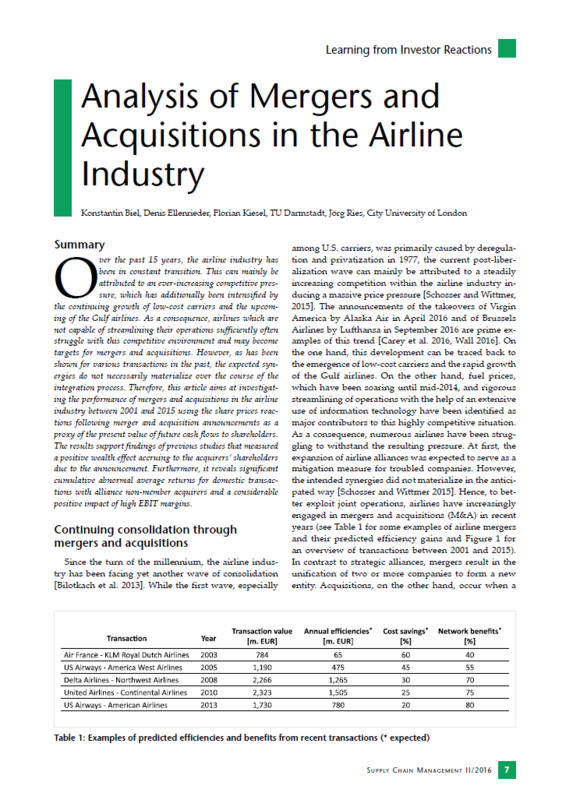 Therefore, this article aims at investigating the performance of mergers and acquisitions in the airline industry between 2001 and 2015 using the share prices reactions following merger and acquisition announcements as a proxy of the present value of future cash flows to shareholders. The results support findings of previous studies that measured a positive wealth effect accruing to the acquirers’ shareholders due to the announcement. Furthermore, it reveals significant cumulative abnormal average returns for domestic transactions with alliance non-member acquirers and a considerable positive impact of high EBIT margins. Newer PostThe Digital Aerospace Supply Chain – a New Paradigm or Just a Fad?